The decision is in, and top college free agent Jimmy Schuldt has picked a destination. Michael Russo of The Athletic reports that the Vegas Golden Knights have signed Schuldt to a one-year entry-level contract. That contract will expire on July 1st, at which point Schuldt will become a restricted free agent and can sign a longer deal with the Golden Knights. The 24-year old Schuldt is not eligible to join the Golden Knights in the playoffs, but will provide the team with another relatively young defenseman moving forward. The team has a core group locked up for the next several seasons, but may need some reinforcements as names like Deryk Engelland, Jon Merrill and Nick Holden approach free agency. The team recently traded away their top defensive prospect in Erik Brannstrom, and while Schuldt certainly doesn’t replace that kind of talent he can offer the team a more polished product right away. That polished product is thanks to four excellent seasons at St. Cloud State, where Schuldt captained the Huskies for the last three years. Winning almost everything possible across his college seasons including “Best Defensive Defenseman” this year, he is a Hobey Baker Finalist for the second time. Offering some offensive upside—118 points in 156 college games explains just how effective he can be—Schuldt is at his best when shutting down cycles in his own end and moving the puck quickly out of danger. The young defenseman has been on NHL radars for some time, and previously attended several development camps including one with Vegas. The Minnesota native apparently reduced his group of potential suitors to five in recent days, and had included the Minnesota Wild, New York Islanders, St. Louis Blues and Philadelphia Flyers on that short list. The Montreal Canadiens, who were also interested in bringing him in, weren’t able to convince him despite a sales pitch from teammate Ryan Poehling. Poehling recently turned pro with the Candiens, along with other St. Cloud State teammates Patrick Newell (NYR) and Blake Lizotte (LAK). 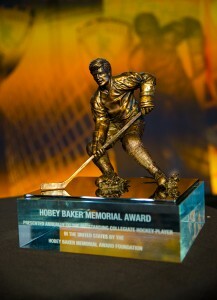 The first round of voting has come to an end, and the ten finalists for the Hobey Baker Award have been named. 83 players were nominated for the award this year, and a fan vote was added to the opinions of NCAA head coaches to determine the final ten names. With the collegiate hockey season entering the home stretch, voting for this year’s Hobey Baker Memorial Award has opened with 83 players nominated for the award. The trophy is given to the top NCAA player in the country, and has an impressive line of winners over the past few years. In 2013-14, Johnny Gaudreau took home the award as a junior for Boston College, followed by Jack Eichel in his only year for Boston University in 2015-16. Jimmy Vesey, Will Butcher and 2017-18 winner Adam Gaudette don’t bring quite the same impact, but look like they’ll each have long NHL careers.